3 Reasons Why I Will Always Cheer for University of Kentucky Basketball: Not the reasons you might think. | journalmehealthy: is what i see in the mirror real? 3 Reasons Why I Will Always Cheer for University of Kentucky Basketball: Not the reasons you might think. 1. Kentucky basketball is pretty much the only sport there is in the Eastern Kentucky mountains. As a kid, the nearest professional team of any sort was Cincinnati Reds baseball, and our ears were tuned to the radio for those games in the summer. Although I’ve been away for 27 years, UK basketball is still in my blood. I grew up in those mountains, in an environment where television wasn’t an option. I can remember working feverishly to get school work done in our two-room elementary school where we attended on Saturday rather than Monday, so that we could listen to Cawood Ledford “Voice of the Wildcats,” call the games. Even if the guidelines had allowed for it, the technical and logistical option of watching any TV was fuzzy, at best. Literally. When I finally had the option of TV as an adult, the ribbon wire that ran nearly a mile up the mountain to an antenna shorted out every time it stormed. We eventually made the then-exorbitant purchase of the 10-foot satellite dish to watch the games and invite others to watch with us. Those are some good memories, with my dad getting caught up in the excitement, and passing along that loyal excitement to me. Cawood Ledford was from a county near where Dad and his brothers grew up, and he talked about him like he knew him personally. There is something about watching games now that makes me feel close to Dad. 2. Somehow cheering on the Kentucky Wildcats makes me feel a loyalty to the mountain people. Life is hard in those mountains and survival is a result of loyalty and courage. Coal-mining is hard work and it can damage health in many ways, but it’s been an industry that has sustained the area for a significant period of time. I have nothing but respect for those who have taken care of their families this way, no matter the risk. Furthermore, if you’re a stranger visiting the area, and you mistakenly drive up the holler, pulling up to someone’s house, you might be met with a rifle-toting homeowner. However, if you have the opportunity to get acquainted and step inside, the refrigerator will be emptied onto the table, day or night, to make sure you never have a pang of hunger while in their company. If you eat what is provided, you have most likely made a friend for life. And I do mean life. So when the Wildcats win, those loyal, hardworking, highly-hospitable people of the mountains win. Even if it is just to get noticed in a world where so many run to the city and miss the calm, laidback, stunning beauty of a frequently-underrated part of our country. Did I say beautiful? There is nothing like casually driving the winding mountain roads, enjoying the green foliage in the spring and summer, or the rainbow of colors in the fall. It’s a truly magical place to get in a relaxing vacation. 3. Because of UK Medical Center, I know the miracle of motherhood. I suppose there are plenty of other places that could have assisted in making that happen, but they didn’t. In 1987, after multiple fertility drug trials, tests, and diagnostic surgeries, I had major surgery at UKMC to repair blocked fallopian tubes. Just over twelve months later, the most beautiful baby girl was in my arms and my life has not been the same since. And if I could turn back the clock, I would go through it all again. So there you have it. You can tell me about the money spent on the program. You can question my loyalty to a school I have never attended. (Maybe I should take an online class just to say I did.) I don’t care. I love to see them win. For the Commonwealth. For the caring, loyal, hospitable people who deserve some nationally-noticed bragging rights. For some great childhood memories. For the gift of motherhood. 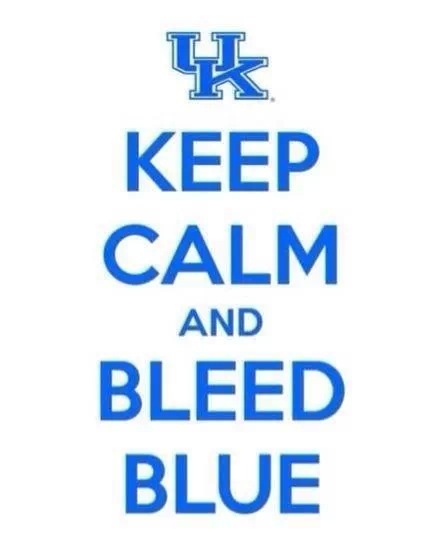 And win or lose, I pray they represent Kentucky with grace. Pingback: Loyalty: Still a Fan | journalmehealthy: is what i see in the mirror real?